Lead generation is one of the biggest priorities for companies large or small. Finding an effective way to generate quality leads can be challenging, especially with so many options in today’s digital landscape. Many companies are now using online forms to collect leads. What’s an online form? You’ve probably filled one out. If you’ve ever subscribed to an email list, registered for a webinar or ordered a product online, you’ve completed an online form. Basically, online forms collect customer information at different times during a customer’s buying journey. Forms are typically used as an exchange between a company and a customer. If a customer wants to receive a 10% off coupon, for example, he or she can fill out a form and have the coupon emailed. The coupon is exchanged for contact information. Why are more companies using online forms to fuel their lead generation strategies? Before you dive in, see this post by Lusha with 7 creative lead gen strategies. Once you create a form, you can sit back and collect contact information. Essentially, you set it and forget it. They’re a hassle-free way for companies to gather customer information over time. An online form takes seconds to create. You only need to add a few fields to a form for it to be effective. For instance, you might ask customers for their name, email, and location. There are a lot of tools that can help you create an online form. Look for tools that offer drop-and-drag editors and customization so you can make a simple, professional form in seconds. Form-building tools are typically affordable. Many platforms offer a free package option so you can check out the form builder and see how it fits into your lead generation strategies. Now that you understand some of the appealing benefits of online forms, you’re probably wondering how to get started. What kind of forms should you use in your lead generation strategies? Check out the list below. Start by creating a form or two for your website. You might consider adding a simple email sign up form for website visitors to join your email list like the one below for subscription-based beauty company, Birchbox. To join, customers simply mark whether they’re interested in beauty or grooming and add their email to the box. It takes seconds. 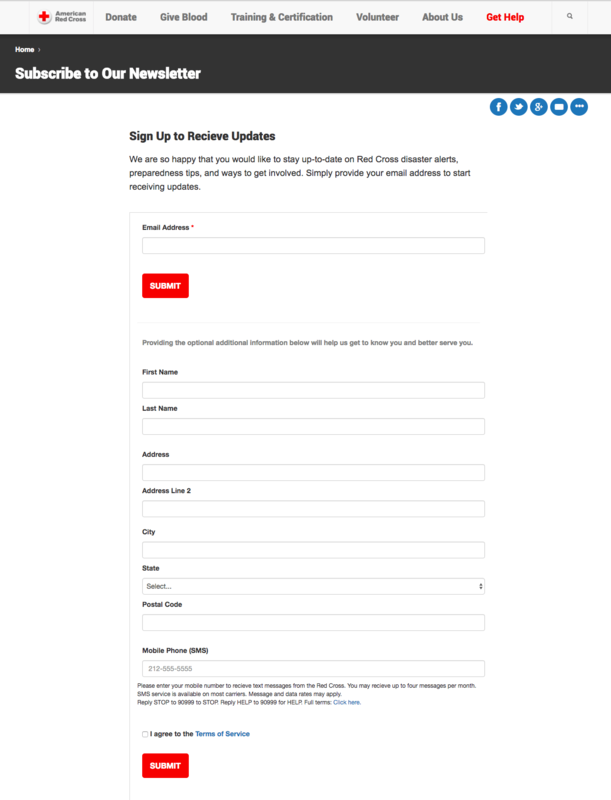 Adding an email sign up form helps you organically grow a list of contacts that are actually interested in your business and product. You can even link the form to your email service provider, so when a new contact joins your list the information is automatically stored in your email account. When you want some quality information from a potential customer, opt for a contact form. A contact form, as the name suggests, asks visitors to provide some personal information including a way to contact them directly. Before adding a contact form, decide its purpose and location. If, for example, the purpose is to collect cell phone numbers on your homepage as a way to ask donors for financial support, you’ll need to create a form that reflects that. The form will sit on the bottom third of your homepage with information that explains the need for the money and how it will be used. The form itself will include several fields like a donor’s name and cell phone number. Let the purpose of the form and the placement of it influence its creation. If a new customer lands on your site, you want to make it remarkably easy to make a purchase. A clean, simple order form is the best way to turn a new lead into a paying customer. And, it’s a great opportunity to collect some personal information – that goes beyond a credit card number. You can customize the order form and ask for a customer’s job title, phone number, or shopping preferences. You might also consider asking customers if they’d like to join your email list during the checkout process. Add a checkbox to your form to give customers the option to receive more regular communication from your company. Now, the new customer moves into the lead retention phase. As a way to capture new leads, consider hosting an event. Whether it’s an online webinar, grand opening or client meet-and-greet, events are a good way to engage potential customers. When you’re using events as a lead capture strategy, think about the kind of event that potential customers would be interested in. Let’s say you sell hypoallergenic vacuums. You could host a demonstration in-store or online that shows the product off and gives new customers a discount. However, the event shouldn’t focus on the product, but rather on solutions. The vacuum demonstration, for example, should focus on how the vacuum improves air quality and keeps a family healthy rather than talk about state-of-the-art filters. Once you’ve designed an intriguing event, set the date and time, and invite customers using an event registration form. If interested, a customer fills out a quick form to register for the event, which gives you an accurate headcount for the event and provides another lead for the sales team to follow up on. Online forms give companies an easy, effective way to gain new leads. There are a variety of forms you can deploy to support your lead generation strategies, and using the suggestions above should give any business owner or marketer a solid form-using foundation. As you use online forms, you’ll be able to see which are the most effective and you can dial-in your lead generation tactics even more. Limor is a technical writer and editor at Agile SEO, a boutique digital marketing agency focused on technology and SaaS markets. She has over 10 years’ experience writing technical articles and documentation for various audiences, including technical on-site content, software documentation, and dev guides. She specializes in big data analytics, computer/network security, middleware, software development and APIs. Say hi on LinkedIn: https://www.linkedin.com/in/limormaayan/ and Twitter: @LimiMaayan.